In fact, an Intuit study predicted that 40% of American workers will be independent contractors by 2020. 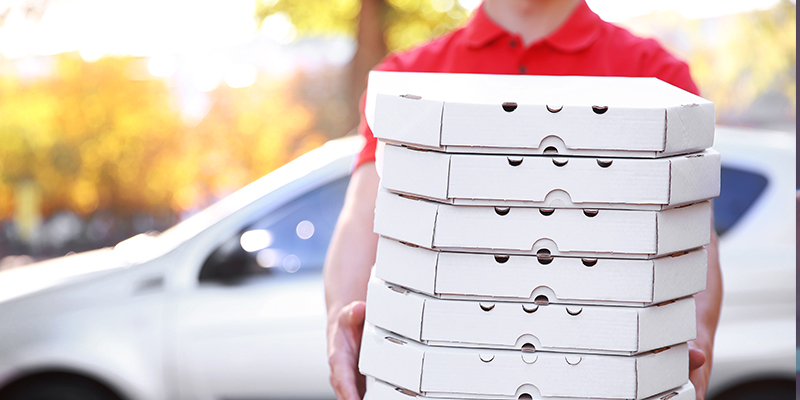 And while these types of businesses are all relatively new and widely popular, the original delivery business that typically comes to mind for most people looking to earn some extra cash is pizza delivery. A couple of weeks ago I was driving home on a Friday evening and probably drove past a dozen vehicles with their respective pizza company's lighted sign atop their hoods. This, of course, is not unexpected on a Friday night (Friday-night binge watching, anyone? ), but it got me to thinking: what kind of auto insurance policy is required if you're driving your own vehicle for deliveries? Side note: this is a completely true story—my life is so exciting that I spend my Friday evenings thinking about auto insurance coverage! Nonetheless, I made a mental note of it and resolved to ask one of our in-house experts this very question. So after digging through email on that following Monday morning, I sat down with Jennifer Lopez, Agency Manager for SWBC's Insurance Partners division, to pick her brain about auto insurance coverage in the gig economy. Q: If someone is driving their own vehicle to deliver for a business such as a pizza company or grocery store, does their standard auto policy provide appropriate coverage? A: Delivery of any kind is not covered by a personal auto policy. In fact, it is not only excluded, but it is what insurers call an ineligible risk. Q. So what should an individual do if they have an auto policy, but they either already or plan to use their vehicle for delivery driving? A: The bottom line is, this requires a commercial policy. If a consumer contacts us for a quote and they deliver pizza or other goods for a living, full-time or part-time, we have to decline the quote and refer them for a commercial policy quote. Q: What is a commercial policy, and how does that differ from a typical policy? A: Commercial auto insurance provides coverage on company vehicles or employees who use their personal vehicles while working on behalf of a business. Typically, the same type of coverage is available for a commercial policy—liability, uninsured motorist, comprehensive, etc.—but due to increased risk, commercial policies are underwritten differently and generally have higher premiums. Q: What are some of the types of delivery jobs that fall in this category and would warrant a commercial policy? A: Delivery can be pizza/food delivery, retail delivery, grocery delivery, newspaper delivery, mail delivery and/or livery (transporting people), just to name a few. Q. What if a consumer has a standard auto insurance policy and is already employed as a delivery driver? A. Since coverage is excluded and ineligible, it is important for an insured to notify their insurance carrier if they do start any employment/delivery service. They would likely be advised to seek other coverage and probably would not have their coverage renewed. This seems harsh, but it’s still very important. A policyholder never wants to find themselves in a situation where a claim could be denied because they are outside the terms of their policy contract. The moral of the story is, if you or someone you know is a delivery driver using a personal vehicle, it's important to review the auto insurance coverage to make sure your (or their) asset is protected under the current policy.